Everett Warren, owner of Green Man Enviroscaping, offers custom landscaping and snow and ice removal services for clients in Central Pennsylvania and finds time to give back to his community through service projects. As a member of Project EverGreen’s SnowCare for Troops, Warren provides complimentary snow and ice removal for the family of a deployed service member in his area. Now in its second year, SnowCare for Troops is funded by THE BOSS Snowplow and was created to help lighten the load for the families of our service men and women. Q: What is SnowCare for Troops? A: SnowCare for Troops is an outreach program coordinated by Project EverGreen and funded by THE BOSS Snowplow that connects local snow removal professionals and other volunteers with men and women serving our country in the armed forces away from home. The program matches volunteers with military families in their local communities to help with the tough task of snow removal on the home front. Q: Why is a program like SnowCare for Troops needed? A: Often the family members left behind are faced with the burden of managing all of the household responsibilities without a support network. SnowCare for Troops lends a helping hand to lighten the load. Q: How do you sign up to help a military family with snow removal services? A: It’s easy to volunteer, and you can join by visiting the Project EverGreen website at www.projectevergreen.com/scft. Hundreds of snow removal companies have already signed up for the SnowCare for Troops program, and many more volunteers are needed. I’m impressed with how professional the organization is and I’m excited about getting set up with my family for this year. It feels good to give back in this way. Q. 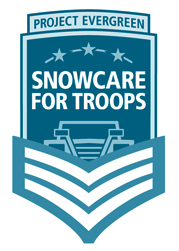 Are there other ways to support SnowCare for Troops? A. Yes. In addition to volunteering, you can loan snow removal equipment to a local volunteer, and you can donate money, transportation or gas cards. Q: Why did you volunteer for SnowCare for Troops? A: I believe it’s important to give back to those who are giving their service to our country. It’s good karma to pay it forward, and SnowCare for Troops helps out in a very concrete way. Q: Why did you choose THE BOSS for your snow removal equipment? A: I research all my business decisions and chose THE BOSS because of its dependability and dealer service. We have had significant snow events in this area, so I do depend on THE BOSS equipment to be in top working condition. I also have confidence in THE BOSS dealer network in case I need parts or service. So far, I’ve not had to worry about that, but it’s an important factor.